Ever wondered what it would be like to have a whole bunch of little squares in different colours, and to be able to play with them and paint them any way you like? And if those squares jiggled about like the happy little quadrilaterals they are? If the answer is no, feel free to step right up and see what you've been missing. 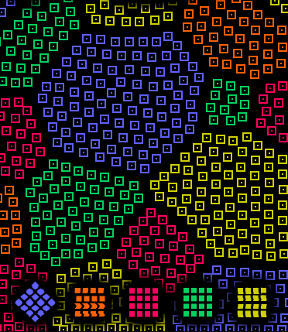 Coloruid is a lovely little puzzle game where the goal is to turn all the squares the same colour in a limited number of moves. Think you can handle it? Alright, let's get jiggly with it! All you have to do is click on one of the squares at the bottom of the screen to pick a colour, then click on one of the groups of squares to paint over them. You can only do this a few times (up to five) per level, so you better watch your step. You can reset a level, but not undo the last move, which is a bit of a pain, though not really a big problem when the levels are this short. What is a big problem is that there are only sixteen levels, because Coloruid is one addictive game, and you'll be done with it long before you even begin to get bored. You may have seen similar puzzlers before, but what sets this one apart is the way the little squares wiggle when you interact with them. It makes their movement that much more organic, and it's fun to watch. However, the unpredictable movement patterns mean that a square or two might decide to go their own way and mess up the level setup, but this happens very rarely. The overall mechanics are simple, but wonderfully effective, and the difficulty increases ever so gently. This is not to say that you won't get a challenge out of it, on the contrary. It's just that Coloruid doesn't aspire to be overwhelming. It's more of a mellow, retro-style, relaxing-music sort of game that certainly deserves a more in-depth sequel. Let's hope it gets one soon. I'd like to mention a mistake you guys made: not only does it have to be monochrome at the end, but it has to end on blue. I'm not sure where you got that idea from, extremeblueness, but the level can be any one color in the end, it doesn't have to be blue. Also, to comment on the review, I found that when one square was getting away, I was attempting to solve the level the "wrong" way. There is another solution that works. Enjoyable game and really nice music--in fact I've left it on as I'm finding it very soothing. Lovely game and a shame it's so short. Can the minimum number of moves be calculated mathematically from any given initial layout? If so the game could be made infinitely long using randomly generated fields.